One of the very first joyful experiences that couples expecting a baby will share is decorating the baby nursery. A crib is one of the first items that parents will start looking for, but often they will overlook another important piece of furniture, the diaper changing dresser which makes changing your baby's diapers a simple task that doesn't require bending which can cause back problems in the long run. Instead of getting a crib that will be useless once the baby gets older, it makes sense to get one that can also evolve as the baby grows. Indeed, nowadays you can find cribs that can easily be transformed into a toddler bed, a daybed and even into a full-size bed for older kids. 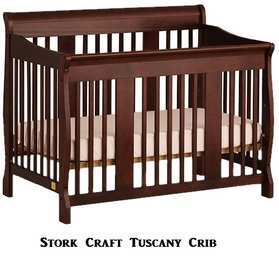 As long as they are of durable quality and attractive looking, such 4-in-1 convertible cribs will represent a smart investment, as they will be used around your home for a very long time. Note that while the guard rail that is required for conversion to a toddler bed is usually included in the purchase of the crib, the rails required for conversion to full-size bed need to be purchased separately (all major brands offer full-size bed conversion kits). When you buy a crib for your baby, besides from the 4-in-1 convertibility feature, make sure it meets or exceeds all U.S. safety standards and is JPMA certified (JPMA = Juvenile Products Manufacturers Association). This will ensure that the crib is built with the child's safety in mind and that no toxic finishes are used when building it. 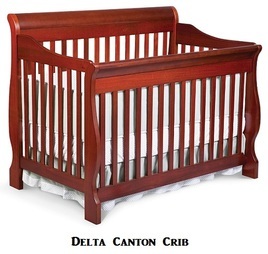 All three above cribs are JPMA certified and meet or exceed U.S. safety standards. The three cribs have a similar sleigh look and come with similar features as you can see from their feature list presented below in the Amazon Products section. 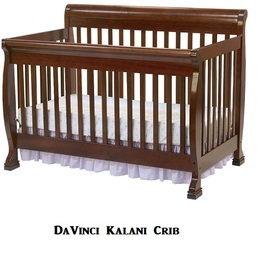 One minor difference is that the DaVinci Kalani provides four mattress settings while the other two cribs provide only three. Also the wood quality of the DaVinci crib (New Zealand pine) is superior to the other two, and it offers a larger choice of colors (see below in Amazon products section for colors offered). The same type of logic can be applied to your future diaper changing dresser as well. Why not get one that can be used not just for diaper changing, but also as as a regular dresser as the baby grows? Indeed, nowadays, you can find attractive and high quality combo dressers that are adapted to easy and safe diaper changing. One important safety feature to look for when shopping for diaper changing dressers is the presence of top safety rails to prevent the baby from falling off the top when diapers are changed (see picture on the left). Not all dressers come with this feature! You should also make sure that ample storage space is available for the various baby related items. 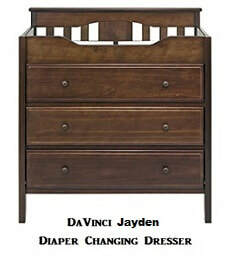 The three diaper changing dressers we are recommending here are the Stork Craft Avalon, Da Vinci Jayden and Delta Eclipse. Like the cribs we have recommended above, these were not just top sellers on Amazon when this article was written, but they have also received top reviews from Amazon buyers as well as independent reviewers. These come all with elegant designs to match the cribs we have recommended, and we think that with their rich wood finishes, these cribs and diaper changing dressers/tables will bring a quiet and subtle elegance to your nursery. Please note the following differences: Delta does not make diaper changing dressers that are equipped with top safety rails. Therefore, we have recommended to buy the Delta Eclipse diaper changing table which comes with top safety rails on all for sides. This table also comes with a water resistant changing pad equipped with safety straps and two open shelves (no drawers). If you choose this product and you still need a dresser with drawers, you will need to get a separate dresser from Delta (see below in Amazon products section for Delta dresser offering). The Stork Craft Avalon dresser comes with top safety rails on three sides only and , while the DaVinci Jayden dresser comes with top safety rails on all four sides. 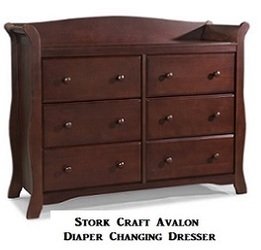 The Stork Craft Avalon dresser has six medium size drawers, while the DaVinci dresser has three very large drawers and comes with a 1-inch waterproof pad and anti-tip kit included. 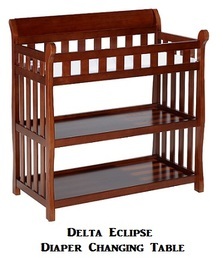 You will find below our selected cribs and diaper changing dressers/tables. For your convenience, a feature list is provided with each product. 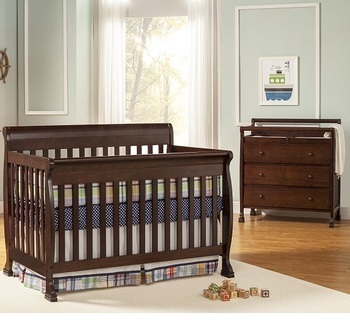 4 in 1 Converts from a crib to a toddler bed to a daybed to a full-size bed. Sleigh design with non-drop sides for the utmost in safety. Meets or exceeds all U.S. safety standards (JPMA certified). Three position mattress support base. Toddler bed guard rail included. Dimensions: 54"L x 33"W x 43"H.
Available in five colors: black, espresso, cherry, cognac and white. Amazon price: around $190 (please click the image shown for exact pricing). .
Universal dresser coordinates with any Stork Craft crib, glider or change table. Features five spacious drawers to fit clothes and accessories. Made with high-quality wood and composites in a safe, non-toxic finish. Available in white, cherry, espresso, black, gray and dove brown finishes. Dimensions: 17.5"D x 35.5"W x 46.6"H.
Amazon price: around $324 . (please click the image shown for exact pricing). Solid wood (New Zealand pine). Four position mattress support base. Dimensions: 54"L x 35"W x 41"H.
Available in 6 colors: white, espresso, cherry, ebony, honey oak and chestnut. Amazon price: around $220 (please click the image shown for exact pricing). Made of sustainable New Zealand pine wood and CARB II compliant MDF. Top safety rails (all four sides). Three large and deep drawers with metal drawer glides and stop mechanisms. 1" Waterproof pad and anti-tip kit included. Available in 3 colors: Ebony, Espresso and White. Amazon price: around $249 (please click the image shown for exact pricing). Dimensions: 54"W x 35"D x 43"H.
Available in three colors: black, espresso cherry, and dark cherry. Amazon price: around $280 (please click the image shown for exact pricing). Made of solid wood (New Zealand pine). Sleigh design (matches the crib). Water-resistant changing pad with safety straps. Available in five colors: black, black cherry, espresso cherry, dark cherry and white. Dimensions: 35.25"L x 21.50"W x 36.75"H.
Amazon price: around $100 (please click the image shown for exact pricing).